You, my friend, are special. You make our lives better. You make each day exciting. You make us constantly learn and learn and learn - about being parents, and about ourselves. I cannot believe that you've now spent as much time on the outside as you did on the inside. Let me just say, THESE nine months were way better than the previous nine (though I did like the idea that when you were inside and you were kicking me, it was like our own little secret- that I got to literally be your lifeline). But having you out here with us? There is nothing better in this life than that. You are growing every single day- physically, mentally, emotionally. 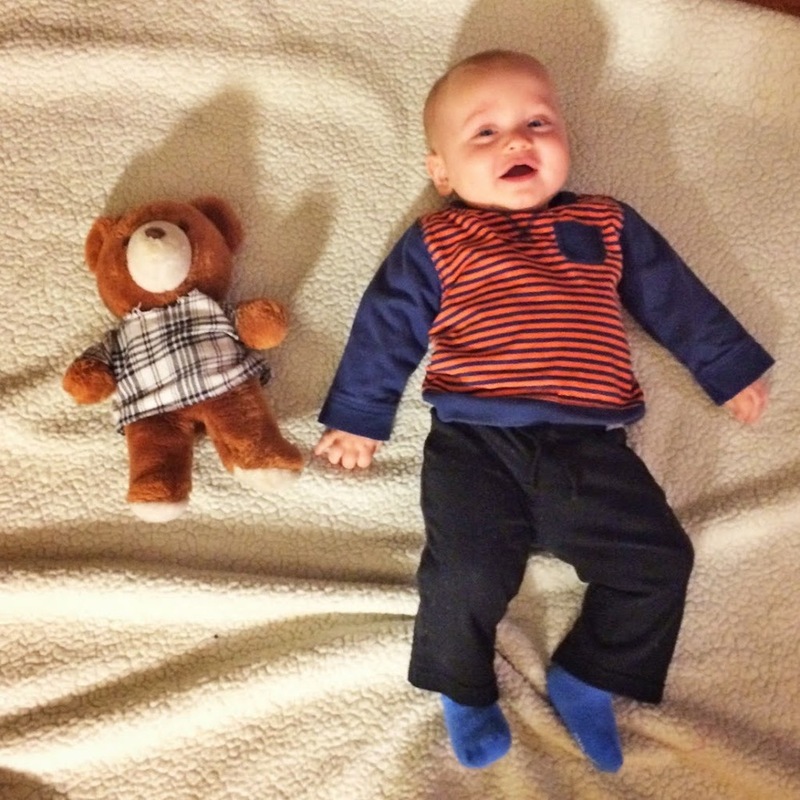 You are finally fitting into size six months clothes, and even outgrowing some of them! Perhaps your clothes will catch up with your age. You are THISCLOSE to pulling yourself up. You aren't crawling, but I have a feeling you're just going to take after me and never crawl. Why crawl when you can just get up and walk, right buddy? You clap, you wave, you laugh constantly. And it still amazes me how often I am stopped when I'm out with you for someone to marvel at how handsome you are, or to tell me what a good baby you are, or to ask if you're always this happy. You're going to be starting your ninth month in a brand new house. You're going to wake up on your nine month "birthday" and be in the home that you're going to grow up in. That you'll take your first steps in (careful with the wood floors! ), that you'll run and play in the backyard, that you'll climb trees and have friends over and become the amazing little boy that we know you will be. You are special. In every way that is indescribable. You make me feel more than I ever knew there was to feel. You've made me a better person, and you've made your Daddy a better person. Speaking of Daddy- can you switch it up and start saying Mama now? Hearing Dada over and over is getting old. But at the same time, it makes my heart swell. Thank you for allowing us to be your parents, Henry. You've made us who we were meant to be. + Mama and Dada + Cereal!